This two piece bipod fits perfectly onto Hatsan air rifles having Weaver/Picatinny side rails on the forend of the stock. The bipod legs can be extended to different lengths and folded back (or forward) for carrying. This is a far superior solution compared to mounting a conventional bipod on the underside of the stock. 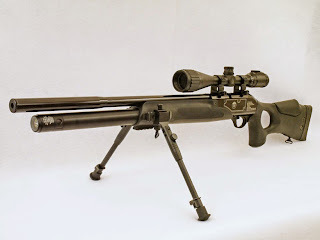 It fits Hatsan AT44-10 Tactical, Hatsan Galatian QE Synthetic, Hatsan BT65SB Elite etc. The photo above shows the bipod fitted to a Hatsan Galatian. It will also fit other air rifles with Weaver/Picatinny side rails. This bipod is manufactured by Stoeger Airguns, item number 90249. It's in stock at Archer Airguns!